Richie Valens | WHAT A FEELING! Richie Valens was the other great rocker who went down in a plane crash with Buddy Holly and the Big Bopper near Clear Lake, Iowa, on Feb. 3, 1959, “the day the music died.” The Buddy Holly story has already been well immortalized on film; now, with La Bamba, it is Valens’ turn. Valens is hardly as familiar a figure as Holly, of course, and he notched only three hits and 17 birthdays before his death. But La Bamba provides ample evidence of why he is worth celebrating. The film is the work of writer-director Luis Valdez, whose previous film experience includes the interestingly disastrous Zoot Suit. Valdez has made a carefully balanced movie. It’s a very traditional film biography, and unafraid of the clichés of the form. But it’s also an uninsistent description of the Hispanic experience, a topic Valdez explores without ever losing the solidly entertaining main thread of the film. The crucial way Valdez does this is by making La Bamba the story of two brothers. Richie (Lou Diamond Phillips) is the nice good-humored boy who becomes a star; Bob (Esai Morales, of Bad Boys) is violently insecure, more volcanic and ill-adjusted. Valdez allows these two to represent twin sides of a single personality—Richie yearning to tap into the American success story, Bob retreating to Mexico to seek the wisdom of the old ways. Planted throughout this stimulating conflict are the hallmarks of the movie biography: Richie’s mom (Rosana DeSoto) pays for a live performance at a small local hall; Richie is spotted by a talent agent (Joe Pantoliano) who suggests a name change from Valenzuela; lovestruck Richie writes “Donna,” a hit single, for his white high-school girlfriend. Along the way, Valdez beautifully re-creates the humid milieu of Richie’s youth in the California fruit-picking world. Valdez makes up for the occasional syrupy patch with some exhilarating music. There’s a marvelous scene when Bob takes Richie to a Mexican bordello for a rite of passage; Richie becomes more interested in the house band as it performs an old Mexican folk song, “La Bamba.” His subsequent, sizzling rock ‘n’ roll reworking of that song embodies the movie’s theme: that traditional Mexican ways may be incorporated into new American forms, without denying either. It helps, of course, that Valens’ recording of “La Bamba” is one of the greatest rock ‘n’ roll songs ever laid down. His music is re-created here by the brilliant Los Lobos, who also appear as the bordello band. There are other clever cameos: Brian Setzer of the Stray Cats plays Eddie Cochran, and Marshall Crenshaw appears as Buddy Holly. 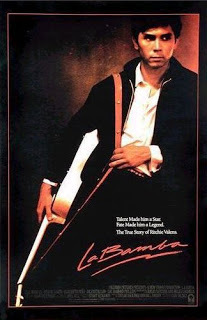 La Bamba was a bit hit at the opening night of the recent Seattle International Film Festival, and Columbia Pictures is clearly counting on the strong word-of-mouth the movie has already generated to carry it past the lack of stars or high concept. It should work, and La Bamba could be this summer’s little movie that goes all the way. Fun movie. In retrospect, I assume Luis Valdez’ approach here was to deliver something that wasn’t commonplace in mainstream American films—a straight-ahead portrait of a Hispanic community—by putting it into a very conventional container. Which worked very nicely. Neither Phillips nor Morales quite took off the way one might have thought, although they’re both hard-working actors, with a few eccentric detours along the way. I just watched Esai Morales in Atlas Shrugged Part II, and you want to talk about an actor flashing his professionalism under absurd circumstances, you got it right there.